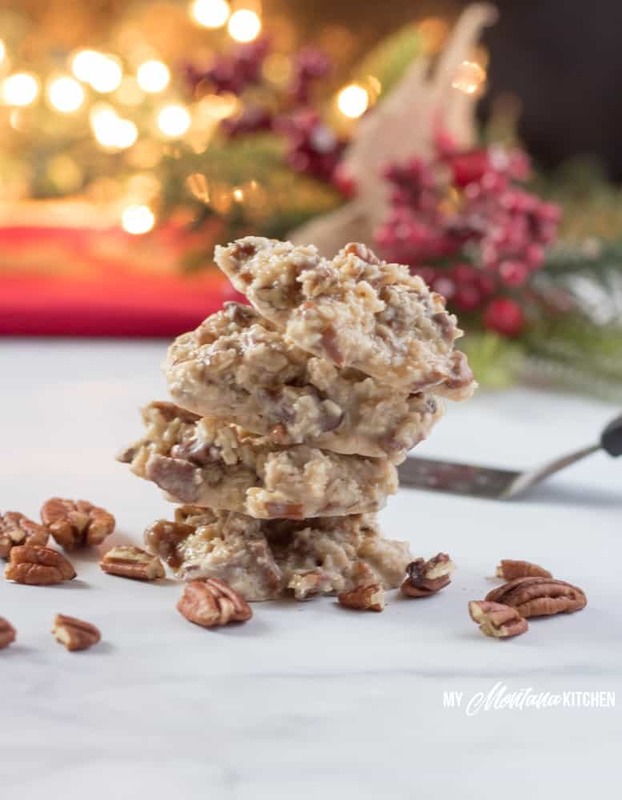 A handful of ingredients, and 15 minutes is all it takes to make these low carb Holiday Praline No-Bake Cookies. 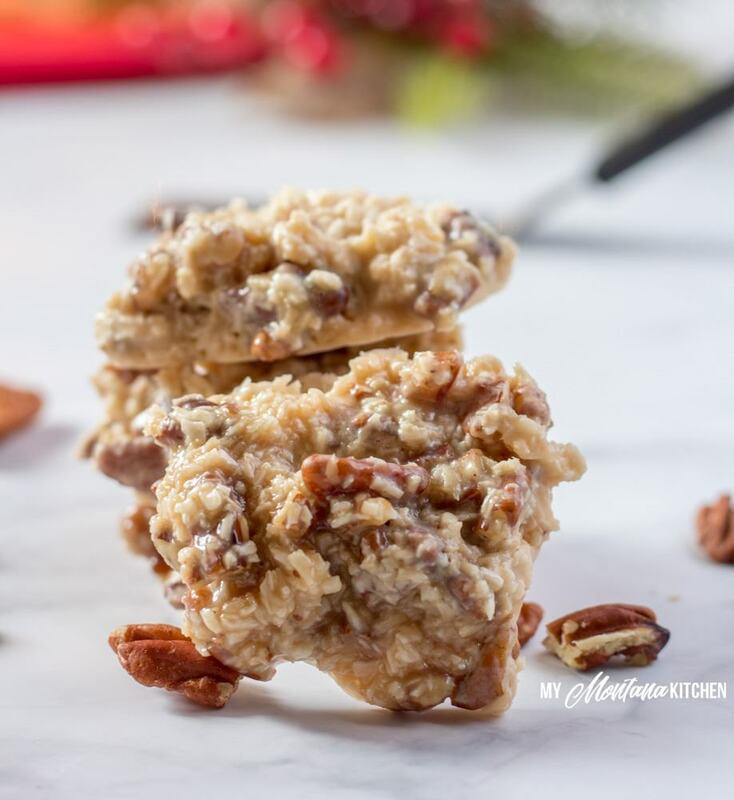 Filled with coconut, pecans, and a low carb sweetened condensed milk, these keto Christmas cookies are perfect! 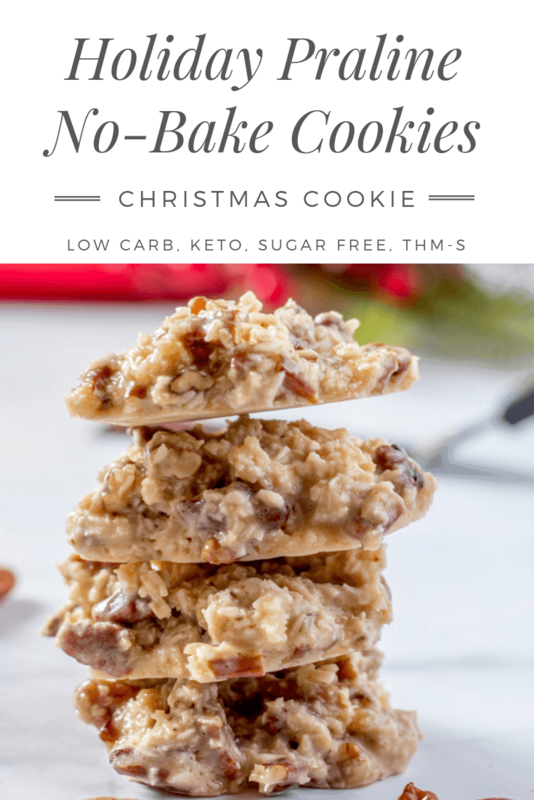 These sugar free cookies are great for keto Christmas Cookie trays, and they are also a Trim Healthy Mama S Fuel! Christmas is no doubt a favorite time of the year for many people. And we have so many traditions associated with food and Holidays. This cookie recipe is so quick and easy – you can be back to your celebrating in less than 20 minutes! I especially love the fact that these cookies are made on the stovetop. This gives you room in your oven to make even more low carb Christmas cookies (like these Soft Gingersnap Cookies)! I decided to use a tweak on my 3 Ingredient Sweetened Condensed Milk as the base for these cookies. If you already have a batch of the Low Carb Sweetened Condensed Milk made up, I believe you could substitute ½ cup of that in place of the heavy cream, butter, and sweetener. 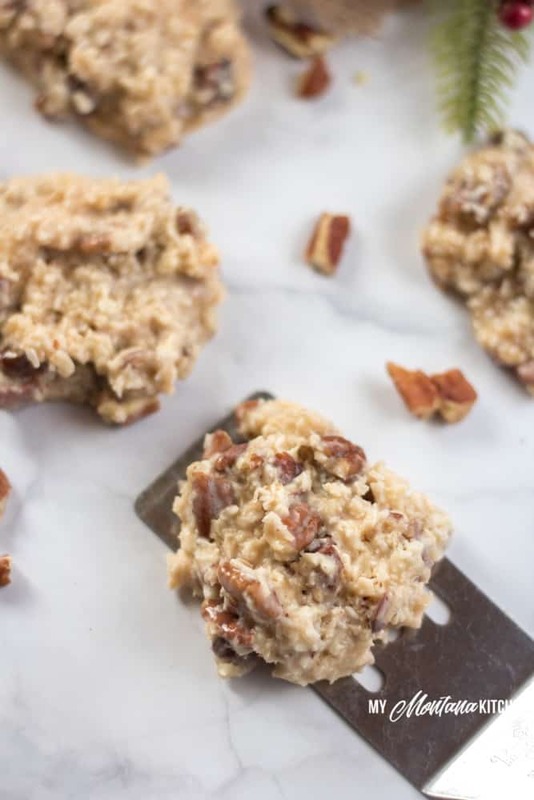 These delicious sugar free praline cookies only take a handful of ingredients (and you probably already have most of them on hand)! All you need is heavy whipping cream, unsalted butter, xylitol (or sweetener of your choice), coconut oil, vanilla extract, shredded coconut, and chopped pecans. Simply, wholesome, real food ingredients. You will be amazed at how easily these simple ingredients transform into an amazing Christmas treat! The steps for making these cookies are as easy as 1, 2, 3. First of all, you want to place the heavy cream, butter, and sweetener in a medium saucepan and bring to a gentle boil. Then turn the heat down to a slow simmer. Let the cream work its magic (it turns into a low carb condensed milk) for about 10 minutes or so. Add the shredded, unsweetened coconut and the chopped pecans, then give the mixture a good stir. Drop the cookie mixture in mounds onto a parchment lined cookie sheet (I like to use my cookie scoop, then flatten them slightly). If your freezer is full, you could even place them outside on your porch (out of the reach of little critters), if the weather is cool enough. And if you are impatient, and must eat them right away, I have eaten them while they are warm and gooey. Make sure that you use the finely shredded unsweetened coconut for the best results. In a pinch you could use the larger flaked coconut, but the results will not be the same. 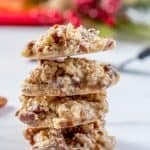 These Low Carb Holiday Praline Cookies work great for Christmas Cookie Trays, too! Once they have solidified, you do not need to keep them in the freezer or refrigerator. I let mine set out at room temperature, and they are fine for about a week. They also freeze extremely well. 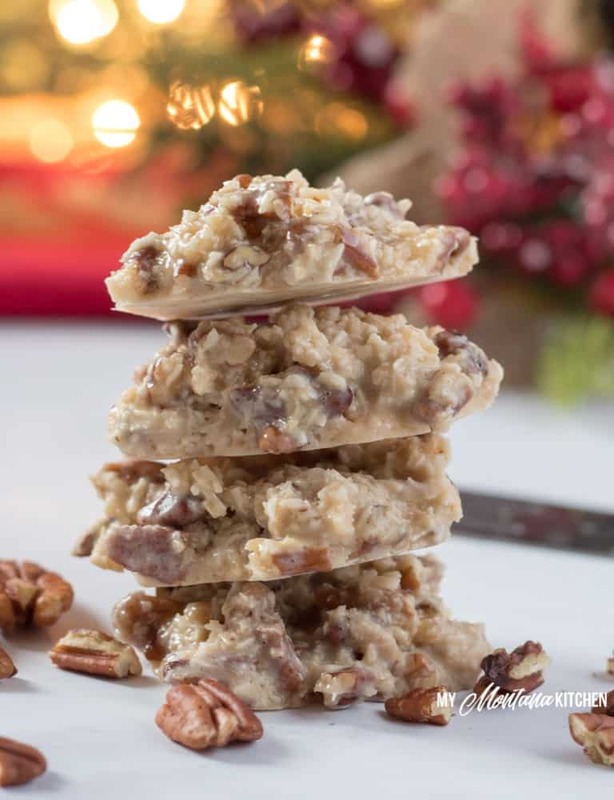 This makes them an ideal Low Carb Christmas Cookie! You can make up a batch (or two) whenever you have the time, then keep them on hand for when you need to take a healthy treat to a party! 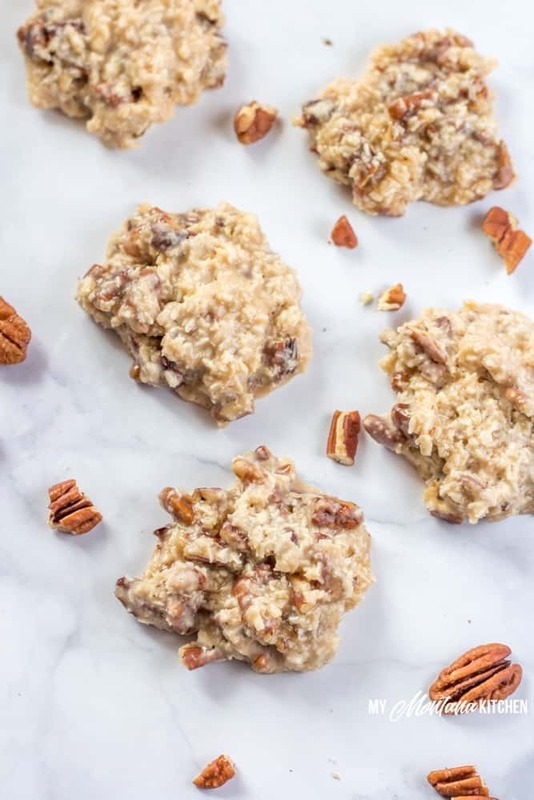 If you enjoy these cookies, you may like some of my other cookie recipes, like Almond Joy Cookies, German Chocolate Cookies, or Soft Gingersnap Cookies – all low carb, sugar free, and Trim Healthy Mama Friendly! 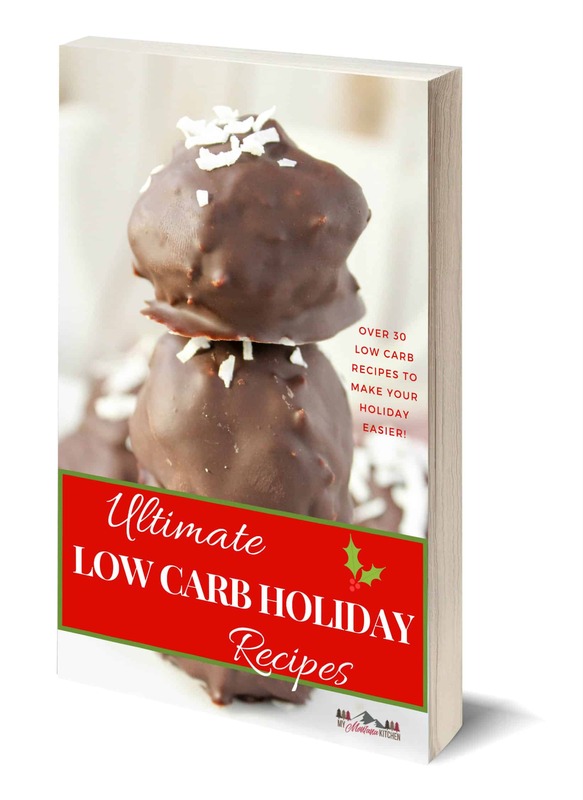 And if you need more ideas for Low Carb Holiday recipes, check out my Ultimate Holiday Recipes Ebook! Absolutely on the Carpenters Christmas…it is a must. Along with all Amy Grant Christmas! Can’t wait to make these…your sweetened condensed milk is fabulous!! I’m assuming these must stay refrigerated at least, no storing at room temp? 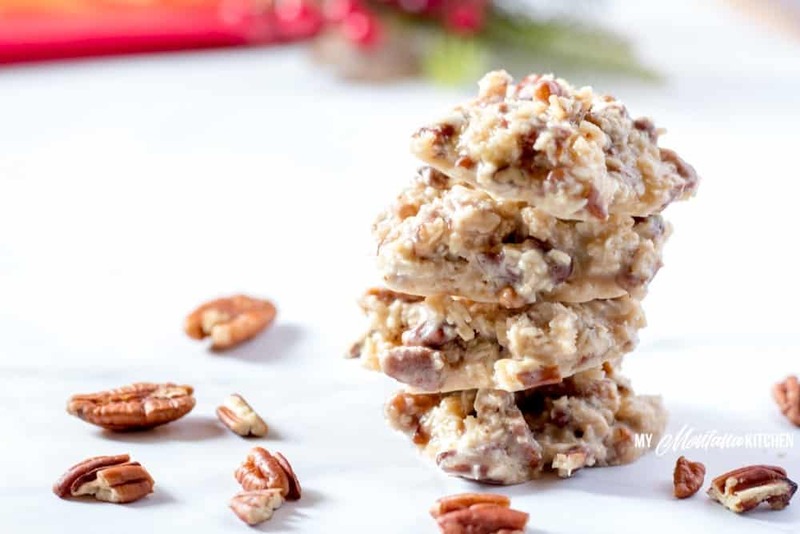 Yum – coconut and pecans – great flavor combination! Thank you for the recipe, it sounds great. I have one question, being new to the THM way of eating. I know your recipe called for xylitol or equilivant of other sweetner. I am not familiar with xylitol but have gentle sweeet and don’t want to waste it, will it be a 1:1 ratio ? If I were using Gentle Sweet, I would use 3 Tbs + 1 Tsp. I love no bake cookies – easy-peasy! You’ll be glad to heat I purchased my Christmas tree today. Bring on the season! I can see why you had difficulty waiting for these to finish! These look delicious and absolutely perfect for a holiday get-together! These look yummy and simple. Praline is one of my favorite ice cream flavors. Ooohhhh…..imagine these broken up in Keto vanilla ice cream! Your post brought back memories for me, Sarah. My mother played Christmas music every day all day between Thanksgiving and Christmas and that is what I remember most about my childhood. These cookies look really good. I can see why you wanted to make them over. Thanks for the recipe. 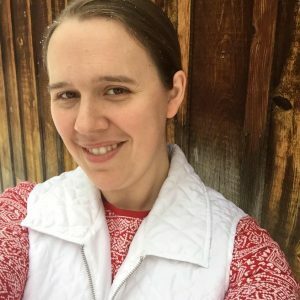 How much trivia would you recommend? I have not cooked with Truvia, so I am not familiar with measurements, but I think I would start 1/3-1/2 the amount called for and adjust to taste as needed. Any ideas for a replacement (especially a THM-friendly one) for those of us who really do not enjoy coconut? Thank you! Perhaps you could use slivered almonds – or all pecans? I love that album, and I cannot wait to try these! Drooling here! These look absolutely amazing! I love love love coconut so these just sound perfect! Made these 2 days ago. They are heavenly, even Hubby likes them. Thank you for this recipe. This is the first time I have ever left a comment on a recipe, but I just had to give my opinion this time. This is definitely the BEST sugar free/low carb cookie that I have made. Just delicious! That’s awesome! I’m so glad you stopped by to let me know! I was wondering if the pecans could be toasted for this recipe. I may try it. Just wondering if you could use half and half, or does it have to be heavy cream? It would not hurt it to stir half-way, but it is not absolutely necessary, as long as the heat is turned down low. Big hit at family Christmas party! I am wondering if I reduced the amount of xylitol will the recipe still work? Has anyone calculated the nutrition values for these? They are great! These are amazing! I’ve made them twice now and they have become my favorite low-carb cookie. BUT I find that I have to keep them in the freezer or they melt apart. I’d like to make them at least fridge stable. Should I simmer them longer? Perhaps . . . I can usually leave mine on the counter and they hold their shape well. I listen to Christmas music and watch Christmas movies year round!! I think that is ok!! We should remember all that Christ has done for us daily not seasonal! Would it hurt to use salted butter? Ok these are amazing ! I only had liquid stevia so made the conversion and I toasted my pecans. So good!! My new favorite cookie, thank you!! What could I use instead of the coconut oil? Thank you! I can’t wait to make these! These are amazing! Making my second batch of the week. They freeze amazingly well. A HUGE thank you for this recipe! Omg!! These are amazing!!!! Everyone from my 1 year old grandson up loved these. My husband says he doesn’t want any other dessert again, just these. They are better than pralines with sugar!! Thank you so much for this recipe!! Awe, what a lovely compliment! I am so glad your family enjoyed them!